How does God accept people? How the Lord accepted Job (adapted from JND) public domain. Job 42 says "The Lord accepted Job". It does not say that God accepted his acts, his deeds, his works, his sincerity, or anything connected with himself. But it does say God accepted Job. Isn't this just what we need - and want? The moment our souls are really awakened to a sense of what God is -holy/just ... and ... to what WE are... we then find a great need to know if/how we can be accepted by God. Until that is known we may try to bring out our best "clothes" and acts/behaviors to clothe ourselves with. But.... when we have really come into God's presence, we clothe ourselves with NOTHING. It is then we are in position to get the sense of the Divine favor. The converse is also true. We know that our works are unholy. And when we ourselves are truly awakened, we look at ourselves (our hearts) as the spring and source of all these unholy works. We then learn that in heart, spirit, and nature, that we are far from God. Then I am grieved, not only for my sins, but because it is "I" who committed them...I may seek to put off thoughts about these works until the day of their judgment, but I myself cannot be satisfied without the sense of my present and immediate acceptance by God. Job had many "friends" and comforters in his great trial but I suppose he could really only say of them: "miserable comforters are ye all." These friends had no real understanding of God's character, nor were they able to understand how God deals with the individual soul. God's dealings with us are intended to bring out what WE are to ourselves (yes, wretched sinners), and that reality being learned as our condition as being in HIS presence. God dealt with Job until Job could only say "I am vile, and I abhor myself." He sought God, honored God, Yet, he learned that "if He (God) contend with me (Job), I could not answer him one in a thousand." Herein is how God deals in a heart, to wring it out, and it can be a bitter experience. But in the end that soul is brought to a blessed place, one of utter dependence upon Himself (God). After all the sifting, Job is brought into God's presence and we read "The LORD accepted Job." You see it is in the presence of God that we learn repentance, and take sides with the Lord against ourselves. We no longer justify ourselves, but as it were, we justify God, and we are accepted. But the OT story of Job doesn't reveal the full story of acceptance. in the book of Ephesians, it says of the believer in Christ, that he (believer) is accepted "IN THE BELOVED." Christ is the beloved, and in Him the believer finds acceptance (literally "graced"). God does not accept us as we are you know. It is only in Christ that He accepts us. Have you gone through the sifting yet, and found yourself vile and abhor yourself? it is here where God will meet you, and the remedy of Christ can be yours, and you find acceptance by God. Lastly a pleasant technical note, this phrase in Job from the Hebrew is very lovely. This "acceptance" means "to lift the face of." The LORD lifted the face of Job. Think of a poor miserable disciplined boy or girl, unable to lift his face to the disciplining adult, utterly despondent. The parent comes - correction completed, places the hand gently under the chin, lifts the face, and speaks words of love to the face and eyes of the little one - who looks up and sees not an enemy, but love. The little one learns acceptance, by this lifting of the face. 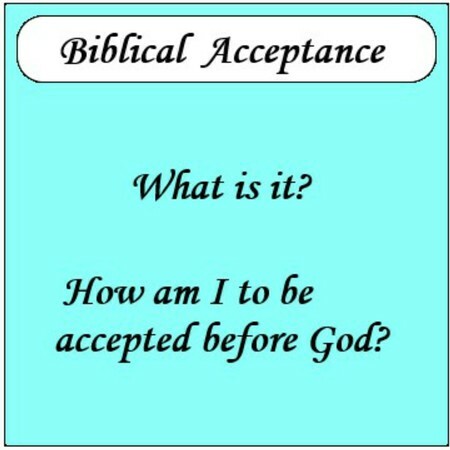 Friend, do you have biblical acceptance before a holy God? There is a sifting, a wringing, perhaps a bitterness, and repentance...and yes there is acceptance. Biblical acceptance. The Hebrew word often translated "accepted" means "to lift the face of" and that indeed is a very lovely thought.